California Gov. Arnold Schwarzenegger praised Russia on Monday as a "gold mine" for foreign investors, during a trade mission intended to help expansion of Silicon Valley companies. 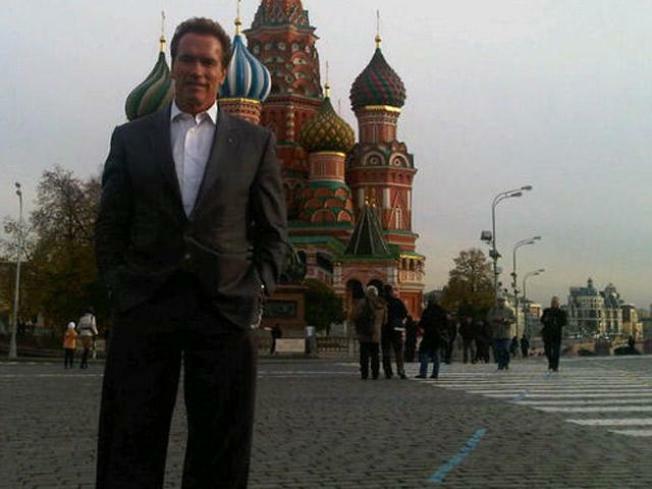 Schwarzenegger has taken a delegation of Silicon Valley business leaders and venture capitalists in his tow to help them establish connections in Russia, which is trying to create its own technological hub. Schwarzenegger, who also visited Red Square, praised Russian President Dmitry Medvedev as "one of those great visionaries" and hailed Russia's investment opportunities. The Russian president visited Silicon Valley in June and has launched the nation's version of it in Moscow's suburb of Skolkovo. "The potential for growth is so extraordinary, it's like looking at a gold mine," said Schwarzenegger, who is to tour Skolkovo with Medvedev later Monday. "All you've got to do is to go in there and get it." Analysts have been more skeptical about Skolkovo, warning that Russia needs to offer more transparent rules for business and to reform its corruption-tainted judicial system to attract more foreign investment. Schwarzenegger didn't address any of these concerns during a breakfast with U.S. businessmen, putting emphasis instead on Russia's vast potential. "The Russian people are extraordinary, and it comes to ingenuity and technology and sciences," he said. "So with those minds and our minds put together, one and one becomes three, magical things. California is a state that has a lot to offer." Officials from Internet search engine Google Inc., software-makers Oracle Corp. and Microsoft Corp., biotechnology company Amgen Inc., and fuel-cell technology startup Bloom Energy are among those accompanying Schwarzenegger on his trip. "In the 21st century to assume that innovation will happen in one small spot only isn't such a great idea, but you can have that spot as a catalyst for action and networking out to the rest of Russia, not just here in Moscow," said Craig Barrett, former chief executive of Intel. Viktor Vekselberg, a Russian energy and metals tycoon whom the Kremlin put in charge of the Skolkovo project, said Monday that it will need 180-200 billion rubles ($6-6.7 billion) over the next five years, half of it provided by the state and the rest coming from the private sector. "This project will only be successful if hundreds of independent companies join in," he said. Schwarzenegger faced criticism for his weeklong trade mission last month to China, Japan and South Korea, which came in the midst of a months-long deadlock over solutions to address California's $19 billion shortfall. Schwarzenegger signed a new budget into law Friday after it passed both houses of the state legislature. It came 100 days into the start of the fiscal year. "I'm very happy that the Democrats and Republicans came together finally to approve the budget so I could come on this trade mission," Schwarzenegger told Medvedev, who congratulated him on passing the budget during their meeting at the Russian president's suburban residence. Medvedev then drove Schwarzenegger to Skolkovo in his vintage car: a Soviet-made, cream-colored Chaika designed in the 1950s. "You're a great driver, Mr. President!" Schwarzenegger tweeted. Speaking at a meeting with U.S. businessmen, Medvedev acknowledged that corruption poses a major challenge. "In our country, corruption isn't seen as something shameful, it's part of everyday life," he said, adding that the government is working on a set of moves to step up the fight against graft. Schwarzenegger said he was thrilled to be back in Moscow, which he visited while starring as a Soviet cop in the 1988 movie "Red Heat." "I never thought at that point that I would be back as governor," Schwarzenegger said. "It's really fun to be back here and meet the president."